Lower back pain on the left side is considered more common when compared to the right side of the back. Although lower back pain in general begins below your ribcage, it’s typical for people to experience left lower back pain above the hip and the leg. This pain may be intensely cold or intensely hot, and may run down the leg and reach the foot. Lower back pain, or lumbago, is one of the most common reasons that people visit the emergency room. In fact, Americans have an 80% chance of experiencing back pain at some time in their lives. This musculoskeletal condition is even thought to be the fourth most common health concern in the U.S.
What Should I Do When My Back Hurts? What Are the Main Symptoms of Lower Back Pain? When Is Lower Left Back Pain More Serious? Got lower back pain on the left side? It was once believed that back pain was caused by the degeneration of one or more disks in the spine, which would result in spinal nerve damage. However, almost every adult over 40 has some sort of disk deterioration and doesn’t experience any pain at all. 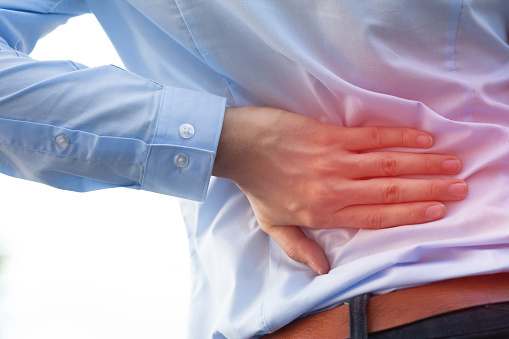 It turns out there are a number of other possible left lower back pain causes. A muscle strain is a common cause of lower left back pain. Continuous pulling on a particular muscle or related tendons can often cause a muscle strain, for instance, after lifting a heavy object. Being overweight or having a weak back or abdominal muscles can increase the risk of muscle strains in the lower back. Suffering from lower left back pain while pregnant is very common. This happens when the growing uterus increases pressure on nerves and other organs. The pain can also travel to the hip and left leg. Structures and disks provide a cushion between the spine and bones, but over time they may shrink, wear out, and rupture, which can lead to a herniated disk. Nerves are sensitive to pressure, and sciatica will result when a lower back disk wraps around the sciatic nerve. A person will typically feel the pain around the buttock, hip, lower leg, or foot. Diverticulitis can also cause abdominal or lower left back pain. Small pouches can develop along the walls of the colon as you age, specifically on the left side of the abdomen. Diverticulitis results when bacteria accumulate in the pouches to the point where an infection forms. Other symptoms of diverticulitis include constipation, diarrhea, nausea, and fever. Severe lower left back pain can be a sign of a kidney stone, a kidney infection, or a urinary tract infection. With kidney stones, the pain radiates to the lower abdomen and down the groin area. With kidney infections, the pain typically starts in the bladder and moves to the kidneys where inflammation and swelling will follow. Ankylosing spondylitis is a form of arthritis in the spine. Lower left back pain mostly affects the lumbar area, hips, and buttocks. It can also affect the sacroiliac joint, which is the lowest part of the spine that joins with the pelvis. Poor posture is a complication for many office workers who are restricted to their desks. Lower left back pain caused by poor posture is often a long-term problem where excess stress is put on the muscles of the lumbar region and the hip flexor muscles. Obesity is another major cause of lower back problems. Being overweight or obese will put stress on the back muscles, increase the load on the spinal column in the back, and contribute to poor posture. Lower left back pain in women can also be a sign of a problem associated with the fallopian tube or ovary on the left side. The pain will worsen if it’s from a cyst, an infection, or a twisting of the ovary. Lower back pain may also be caused by pregnancy developing at the left ovary or fallopian tube instead of in the uterus. For men, a testicular infection, twisted testicle, or tumor can also cause back pain on left side. Spinal stenosis is another back problem. In this case, the spinal canal narrows and leads to pressure on the spinal cord. Causes of spinal stenosis include bone spur formation, arthritis, or a herniated disk. As a result, the person may experience lower back pain on the left side in the form of weakness or numbness. Other left lower back pain causes include sacroiliac joint dysfunction, pain in the left quadratus lumborum muscle, cauda equina syndrome, osteoporosis, cancer involving the spine, sleeping on a poorly made mattress, wearing high heels, smoking, nutritional deficiencies, prostate disorders, pelvis problems, premenstrual syndrome, emotional distress, and inactivity, especially when followed by sudden exercise. All of a sudden–you’ve got lower back pain on the left side–and you want to know what to do to relieve the pain right away. It may make sense to you to refrain from any physical activity while you recover from back pain, but this may not be the best solution since the back may lose endurance, flexibility, and strength. Instead, you should maintain physical activity, while at the same time being careful to avoid any sudden movements that might aggravate pain. Try to perform low-impact exercises such as water aerobics or walking, and apply an ice pack on your back for 15 to 20 minutes around five times daily to reduce soreness, inflammation, and swelling. It’s also a good plan to sleep with a pillow between your knees and on your left side to help relieve your back pain. Skin numbness or weakness around certain muscles, making it hard to lift or move the big toe or the whole foot. Lower left back pain isn’t thought to be that serious, and therefore you shouldn’t worry unless the pain becomes fairly persistent, that is, if you have experienced it for six weeks or longer. When there isn’t really any improvement and/or the lower back pain actually seems to be getting worse, it’s considered chronic lower back pain. Psychosocial factors thought to increase the risk of lower back pain include high levels of emotional distress, social isolation, resistance to change, and certain beliefs or attitudes. Chronic back pain can lead to loss of libido, insomnia, feelings of hopelessness, and depression. It’s thought that 90% of those with lower left back pain will see symptoms disappear without any treatment in a few weeks. That said, there are a number of natural remedies to help speed the process along. A systematic review published in the International Journal of Yoga in 2015 found strong evidence that yoga is effective in the short-term for lower back pain. Other randomized controlled trials suggest that yoga is an effective complementary treatment for chronic lower back pain. The most popular herbal remedies for treating lower back pain include white willow bark and devil’s claw. High-quality studies have found that found that devil’s claw was more effective than a placebo in the treatment of back pain. Willow bark contains salicylates, which is the precursor of aspirin. Other herbal remedies for back pain include boswellia, ginger, cayenne, pine bark extract, grape seed extract, alfalfa, yucca root, and devil’s claw root. Homeopathic remedies are considered effective for acute and chronic lower left back pain. For acute back pain, it’s best to take a 30x potency four times each day. For chronic back pain, it is best to take the remedy twice daily for two weeks. Remedies recommended for lower back pain include aesculus, berberis, calcarea fluorica, natrum muriaticum, nux vomica, rhus toxicodendron, ruta graveolens, magnesia phosphorica, sepia, arnica, ignatia, calcarea carbonica, bryonia, and cimicifuga racemosa. Methylsulfonylmethane, or MSM, and bromelain are two common natural anti-inflammatory supplements used for lower back pain. MSM is known alleviate muscle spams, while the proteolytic enzymes in bromelain can help reduce tissue and muscle inflammation. Turmeric can also make bromelain’s effects stronger. Other remedies for treating lower back pain include glucosamine sulfate, vitamin C, dimethyl sulfoxide, calcium, magnesium, collagen, DL-phenylalanine, protease enzymes, and vitamins B1, B6, and B12. Who Is at Risk of Lower Left Back Pain? What Are the Diseases Associated with Lower Left Back Pain? There are a number of different people at risk of lower back pain. You may first notice lower back pain in your 30s, and it may worsen from that point forward. You may have a greater risk of lower back pain if you are overweight or obese, have an inactive lifestyle, or have a job that requires heavy lifting. Can You Strengthen Your Back to Prevent Pain? Prevention is considered the best approach for back pain. There are various ways to prevent back pain and strengthen your back muscles. Here are few things you can try. It’s important to stay in shape by getting the recommended 30 minutes of exercise at least five times a week. Some low-impact exercises include swimming or walking. You may also consider working with a personal trainer to avoid any further back pain. You should also do regular exercises that strengthen your abdominal and core muscles, which will further reduce the risk of back pain. Avoid standing for long periods of time, although if you must stand for work you should alternate resting your feet on a stool. When sitting in a chair at work, make sure you are sitting with a straight back, and that the chair also has a swivel seat, armrests, and an adjustable back and seat. It’s also good practice to use a small pillow behind your lower back when sitting or driving for long periods of time. You have a history of back pain, but currently the pain feels much worse. Dietary measures: Diet and detoxification can help free the body from toxic buildup, constipation, and extra weight that may lead to back pain. Eat plenty of fibrous vegetables, while staying away from food high in sugar and saturated fat. Also avoid anti-inflammatory substances like alcohol and caffeine. Acupuncture: Several studies cite acupuncture as an effective treatment for chronic lower back pain, including a meta-analysis published in the American Journal of Chinese Medicine in 2013. Massage therapy: Massage is very effective for back pain. It’s definitely worthwhile despite any perceived obstacles, including getting a referral from your doctor. Aromatherapy: Many essential oils have relaxing and stress-relieving properties, including lavender, jasmine, and geranium. Other good essential oils include peppermint, Idaho balsam, and frankincense. If you are suffering from lower back pain on the left side, then try the relief tips listed above. As always, speak with your doctor first. “Lower Back Pain on Left Side,” MD Health web site; http://www.md-health.com/Lower-Back-Pain-Left-Side.html, last accessed March 17, 2016. “Lower Back Pain of Left Side,” EnkiVillage web site; http://www.enkivillage.com/lower-back-pain-left-side.html, last accessed March 17, 2016. Shah, M., “Causes of Lower Left Side Abdominal and Back Pain,” Livestrong web site; http://www.livestrong.com/article/272665-what-causes-lower-left-side-abdominal-and-back-pain/, last updated Sept. 18, 2015. “Causes and Treatments for Lower Left Back Pain,” Back Pain Types web site; http://www.backpaintypes.net/, last accessed March 17, 2016.